Originally established in 1978, HMEC Co. is a quality and service-oriented company dedicated to the bearings and power transmission supply for industrial and automotive markets over 30 years. Decades experiences and unremitting efforts enable us to meet with the innovation of bearing technology as well as customers’ demand for quality and cost. HMEC cherishes ‘quality’ is the only thing can make us survived and distinguished among the other brands. 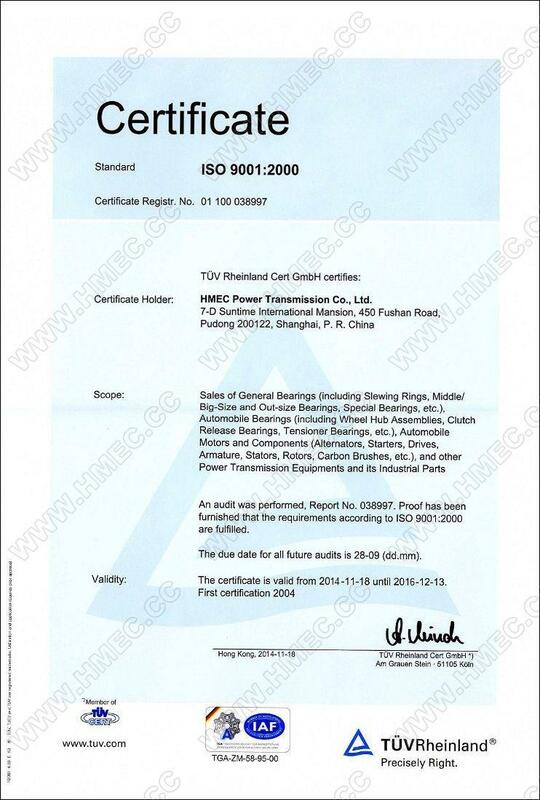 HMEC has been TUV ISO9001 certified since 2004 and most manufacturings have been ISO/TS 16949 certified. Since the first step in OE supply to a washing machine plant in Chile in 2001, HMEC has been more and more involved in OE commitment with 28% of the turnover has been contributed by OE business in 2013. We have the boast to offer to our customer a best technical-economic balance for engineering solution and cost saving. HMEC’s Quality Control, Technical Data, Manufacturing & Devices. 1978, Hunan Mechanical & Electrical I/E Corp. (HMEC) which as a subsidiary of China Machinery & Equipment Corp. (CMEC) was originally set up in Changsha, Hunan Province, China. 2001, HMEC moved to Pudong Shanghai, in order to provide a better service to the international customers. 2003, HMEC reformed from state owned to private and changed the company name to HMEC POWER TRANSMISSION CO., LTD.
2004, HMEC signed the strategical Only Distributor in UK & Ireland to GODIVA Bearings (Group) Ltd.
2007, a new company HAN MECHANIKA LTD. (HMEC) was established to manufacture Auto Parts. 2009, HMEC (CHINA) CORP., LTD. was set up as the head-quarter of the HMEC subsidiaries. 2012, HMEC set up the Europa Representative Office and Logistic Center (GBearings S.p.A.) mainly for Auto Bearings & Parts in Torino, Italy with the cooperation of GHIBAUDI Group.